Sandie Smith had been using Instacart for months, when one day she received a store receipt. She discovered she was paying around 10 percent more than what the shopper paid in-store. BALTIMORE — Sandie Smith started using Instacart after she injured her elbow. "I hate to admit to my age, but I'm 75+ and I have osteoarthritis of my knees, so it's difficult for me to get around," Smith said. 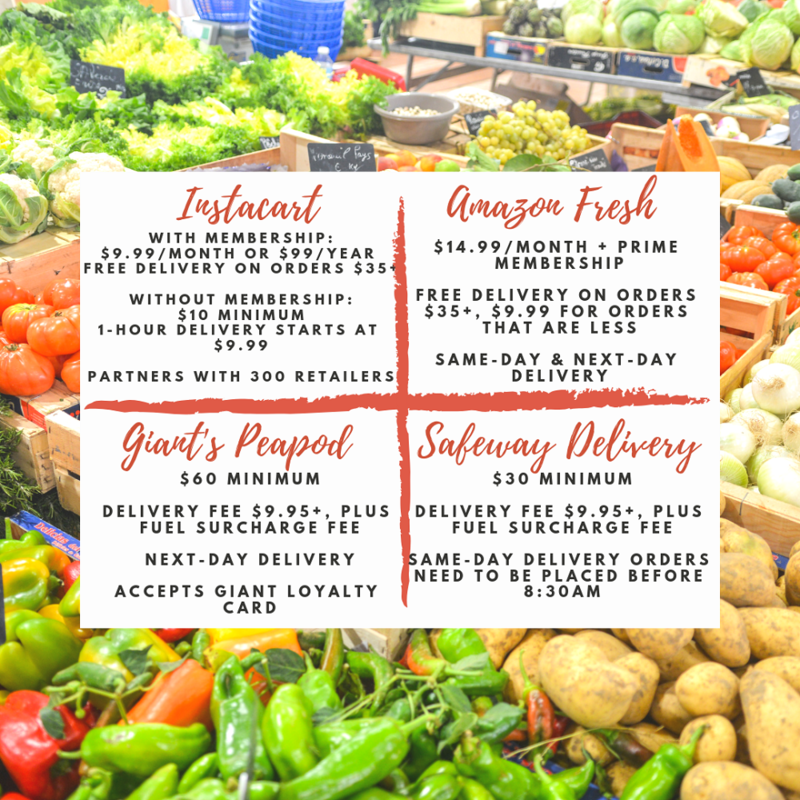 She had tried grocery delivery services like Giant's Peapod and Safeway Grocery Delivery, but what she really wanted was fresh foods from her favorite local store, Graul's Market. Instacart was the only service she could find that delivered from Graul's, so she started using it last August. In December, she made an unusual discovery. "When I got my order, there was a receipt from the store that the shopper shopped at. There had never been a receipt until that time, I just went by what Instacart charged me," Smith said. Line-by-line the retired nurse started to compare what the shopper paid and what she was charged. "When I got grapes, the Graul's receipt read $4.81, the Instacart receipt was $7.62," said Smith. The sticker on her ham read $11.87, yet she was charged $13.06. Smith also pays $9.99 a month for delivery plus tip on each order, and she doesn't get discounts from her preferred shoppers card. She knew the service wasn't cheap, but she didn't realize she would be paying more for individual items. "As a senior, I resent that. I'm having a hard enough time with rent that goes up, the cost of medications, and I'm on a fixed income," Smith said. According to Instacart's website, retailers set the price for products on the platform. You can also view individual store's pricing policies in the app. For many, it will say prices vary from in-store. 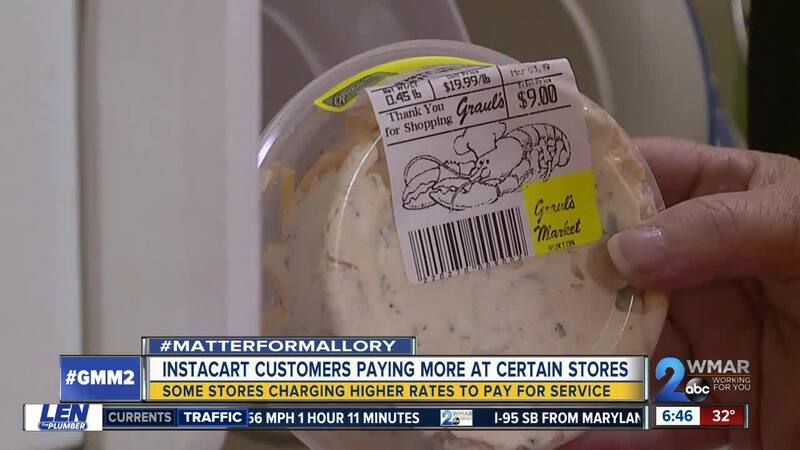 WMAR-2 News Mallory Sofastaii tried the app at Safeway and requested a receipt. She also noticed a difference in prices. A bag of tortillas cost $0.80 more on Instacart. Onions cost $0.85 more. "There is a premium pricing structure for delivery orders. Safeway is looking at options to reduce delivery costs so we can offer competitive prices to our delivery customers." WMAR-2 News also contacted other grocery chains on the platform. "... while there may be a slight price increase on certain items sold on Instacart to cover the cost of personal shopping, whether online or in-store, ALDI will continue to offer consistently lower prices than other retailers." Giant Food and Harris Teeter did not respond to our request for comment. Graul's responded to Smith by email. They said because Instacart charges them a significant fee to use their website and delivery service, the prices on Instacart are their regular prices plus a 10 percent charge to offset Instacart's fees. For Smith, these markups only amount to around $10 more per order, but considering she places an order every week that's hundreds more per year, not including the cost of delivery. "I have to watch my pennies as I think many, many seniors do. And at first, I was very embarrassed to say to my friends 'Hey, I can't go out to lunch with you this month because I've really got to watch my money,' but that's what it's gotten to be and I found out, I'm not the only one," Smith said. Smith said she plans to continue using the service. She's diabetic and feels Graul's food best fits her dietary needs. If you want to see the price difference for yourself, be sure to request a store receipt from your Instacart shopper. Shoppers are advised not to provide customers with paper receipts, however, Instacart wrote in a statement to WMAR-2 News: "Shoppers are not penalized for providing in-store receipts requested by customers." And if you don't want to pay a markup, look for the words "everyday store prices" in the pricing policy. In Baltimore, in-store partners include Shoppers, CVS Pharmacy, and Petco. If you're a senior struggling to make ends meet, there are food programs in our area that can help. The Maryland Food Bank has a monthly program called My Groceries to Go! , where low-income seniors in the Baltimore area can stock up on essentials. Meals on Wheels home-delivers food and there's no income requirement. They also have a grocery assistance program. And in Baltimore City, there's the Eating Together Program where seniors 60 years and older can have a free meal at one of the 50 Eating Together centers. They ask that participants make a small donation but it's not required. For more information on programs available in other counties, click here .